prize 2: Wet n Wild's Club Havana [its actually a bit more orange, a lot less red irl), China Glaze's Glitter Goblin, & Sally Hanson Salon Effects Nail Polish Strips in Skinny Jeans. prize 3: Barielle's Sand--al Chic, Sinful Color's Cinderella, & Studio M's Magic Attraction. prize 4: Sinful Colors' Green Ocean, Revlon's Whimsical, & Ulta's Oh!. 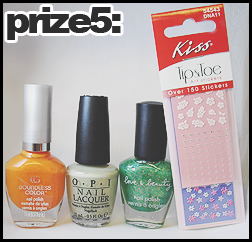 prize 5: Cover Girl's Candy Corn, OPI's Stranger Tides, Forever 21 -- Love & Beauty's Light Green [the sticker/tag fell off this polish btw], & Kiss' Tip & Toe Art Stickers. 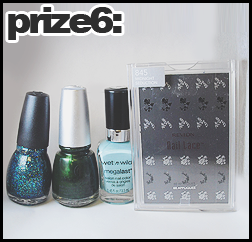 prize 6: Sinful Colors' Nail Junkie, China Glaze's Jolly Holly, Wet n Wild's I Need A Refresh-Mint, & Revlon's Nail Lace stickers in Midnight Seduction. the giveaway is opened internationally. the giveaway will start Tuesday, October 9th, eastern time, and end Tuesday, October 30, eastern time. * there will be up to 6 winners who will be chosen through random.org ; the winners will be announced a day or two after the giveaway has ended -- the winners will have 48 hours to respond to my email or else i will choose a new winner. 1] you must be following me - - whether it is through GFC, Bloglovin, email subcriptions, Nail Art Tumblr, and/or Personal Tumblr. 2] leave your username that you're following me under. 3] leave your email address -- so i can contact you in case you win. 4] 'like' Katrina's Nail Blog on Facebook. 5] follow @kahtreenahh on instagram. Awesome prizes! I hope I win! Yay! Thanks for this giveaway!